Whiplash is a unique injury that occurs most often to drivers and passengers involved in rear-end collision NJ automobile accidents, when the force from the impact causes the head to snap violently back and forward. Because the term “whiplash” has developed something of a negative connotation through the years, today the injury is commonly referred to as cervical sprain, cervical strain, or hyperextension injury. No matter its name, a crash does not need to happen at high speed for a whiplash injury to result, because even at low speeds the unexpected impact can cause injury to vertebrae, muscles, and ligaments in the neck. 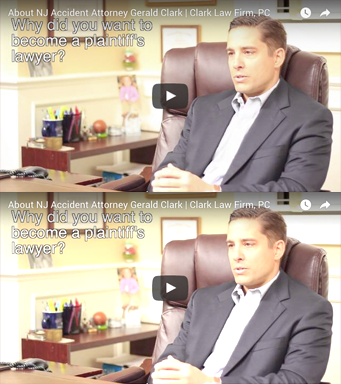 If you are suffering from a whiplash injury, the experienced NJ car accident lawyers at Clark Law Firm, PC can help prove your case. They will examine your medical records, including from general physicians, back and neck experts, chiropractors, or neurologists. Treatment from such medical specialists can include immobilization of the neck (with a brace or cervical collar), range-of-motion and physical therapy, muscle relaxants, magnetic resonance imaging (MRI), and massage therapy. In severe cases of whiplash injuries, where muscle or ligament damage is extensive, cervical traction and even surgery may be necessary. Whiplash injuries may seem minor at first, especially due to the lack of any visible symptoms, but if left undiagnosed and untreated whiplash injuries can lead to chronic pain. Untreated whiplash injuries can also make a person more susceptible to future back and neck injuries. If you have been involved in an automobile accident or other incident in which you have suffered injury, it is crucial that you receive medical attention, then contact an experienced NJ automobile accident attorney at Clark Law Firm, PC 877-841-8855 to guarantee that your legal rights are protected.